In their recent deliberately controversial post about chores, Nicoleandmaggie argue that cleanliness is not necessarily as important as we sometimes make it out to be. In the comments, there was a discussion of "tschotkes" and whether or not they are worth keeping. Nicoleandmaggie make a good point that more stuff just means more stuff to clean, but.... I love my stuff! In thinking about why, and which stuff, exactly, it is that I love, I realized that I usually hold on to things primarily because they remind me of something happy. There are the things that were given to me by people I care about, obviously, but I was somewhat surprised to discover that the things that matter most to me- i.e., that I would be least willing to give away- are things I've collected on my travels. One of the things I really enjoy when I'm traveling is looking for the "perfect" souvenir. 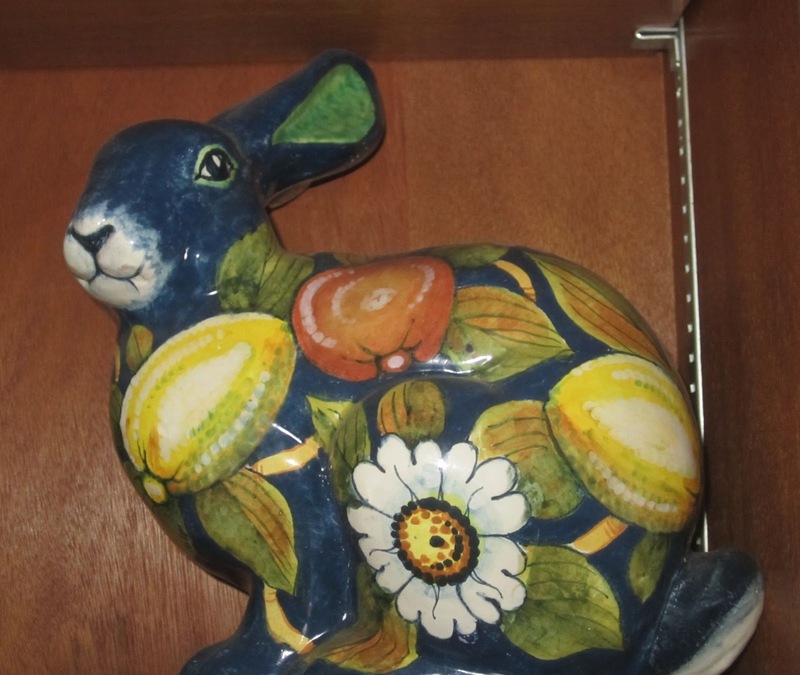 Some of my favorites are absolutely useless but quirkily perfect for me, such as this large ceramic rabbit I bought in Orvieto, Italy, and then lugged back home. We were in Italy (primarily Rome) for the period between Christmas and New Year's, 2001, traveling back home in early 2002. Everyone was still noticeably jittery about airplane security, so security was ultra-tight. The rabbit, wrapped carefully for transport, was x-rayed twice at the Rome airport, and I was sure they were going to unwrap the entire thing. But they just asked us what it was, nodded when I said "a ceramic rabbit" as if that was the most normal thing in the world for someone to be transporting in their carry-on luggage, and let us through. I smile every time I see it on our bookshelf: at the absurdity of the object itself, my memory of the pleasant day trip we took to Orvieto with my in-laws, and at the difficulty of transporting the thing back home. Other things are decorative in the more usual sense, such as this buffalo hide carving of an elephant, which is hanging in our living room, next to another buffalo hide carving of traditional Thai dancers. 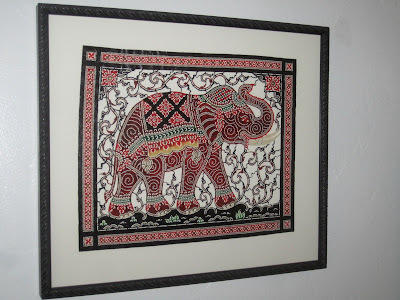 We bought the carvings at the weekend market in Bangkok, while on our big trip. The market is huge, and we spent several hours wandering around, looking at the stalls. We bought several things, too. These hide carvings were definitely the most expensive. I think the two of them set us back about $35, but I can't remember for certain. They were also among the last things to arrive home. We sent ourselves packages at various times on our trip, with souvenirs we'd bought and a CD copy of the pictures we'd taken since the last package, as a backup. These carvings were rolled up in a large tube. Even though it was sent roughly halfway through the four month trip, it didn't arrive at our home until weeks after we did. That was a nerve-wracking wait! We had told ourselves we were prepared to lose a package, but when faced with the possibility that we might actually lose one, we were quite sad. Luckily, it made it. Looking at those carvings reminds me of the wonderful times we had in Thailand, of the craziness that was the market, and of that slightly stressful wait. Then there is our ukelele. 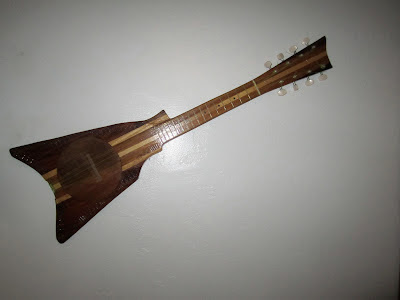 My husband does actually know how to play the ukelele, but ours primarily hangs on our office wall. It was a wedding gift from our best man, who is from the Cook Islands (where we got married). It was made by one of the people on his home island, and it is beautiful. Looking at it reminds me of our wedding, of course, but also of our good friend and his beautiful homeland. There are more things, of course... the prints of pastels of clouds that we bought in New Mexico from local artist Kathleen O'Bryan (who, by a weird coincidence, had also spent time in the Cooks). The decorative plate I bought in Barcelona. Our pint glasses from Powell's Books in Portland. The tea set from Japan. The awesome little rabbit sculpture I picked up in Bath... Each one makes me happy to look at. But I will admit that we work to find the right balance between displaying the things we've picked up on our travels and keeping our house from being a cluttered mess. Maybe that is why I particularly like finding interesting and unusual jewelry when I travel. It is small and almost practical! 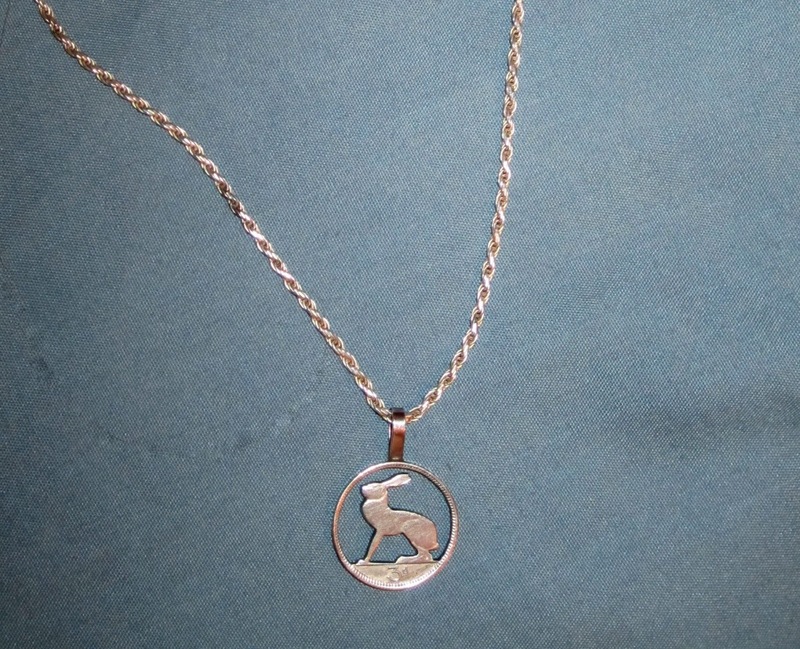 My all time favorite find may be the rabbit necklace charm from Ireland. It is made from a piece of their old money- I think this one was money that was used before they went decimal (but still kept the Irish punt). 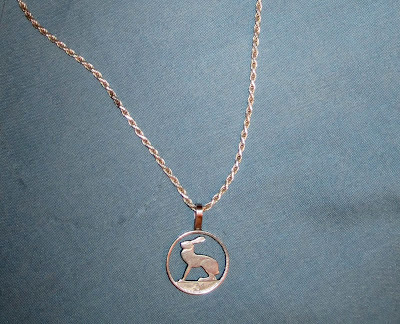 So it is at least two iterations out of date by now, although it was only one step removed from legal tender when I bought the necklace. I thought the idea of turning unusable coins into jewelry was brilliant. And it was a rabbit, too! (Yes, I do have a thing for rabbits- but that is a story for a different post). 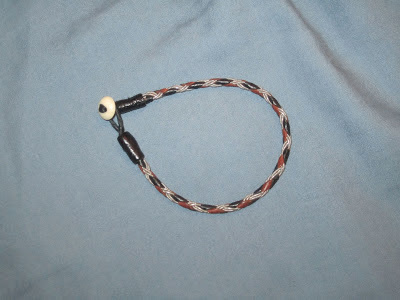 Another favorite is the braided leather and silver bracelet I bought when I spent a couple of months in Sweden during graduate school. It is from the Sami people, who live in the Arctic region of Sweden and several other countries. I didn't make it to the northern part of Sweden at all, but a couple of the museums I visited had good sections explaining their culture. I think I bought this bracelet at a shop in Stockholm. It reminds me of my first big international travel, which I did solo. I flew into Stockholm and had to get myself to the train station and on a train for Lund, which is in the south of Sweden. I didn't understand how everything worked, and made several mistakes on that trip. But it all worked out, and I look back on that trip as one that gave me a lot of confidence in myself as a traveler. I have other favorite jewelry from my travels, too: shell earrings from Easter Island, a greenstone necklace from New Zealand... none of it is worth much money, but they are all very dear to me. I think this pattern started very early for me. There are specific items I had as a kid that were special because of where they came from, not what they were. Now that Pumpkin is old enough to ask for souvenirs when we travel, I see her doing something similar. She has started picking out pins, and putting them on her backpack. She has a couple of other "important" souvenirs, too. As much as I grumble about finding all of her precious things homes when we're picking up her room before the cleaner comes, I can't really begrudge her these souvenirs, because I have my own souvenirs, too. The cheap plastic toys that we get in favor bags and refuse to throw out... well, those are another story, and have been known to mysteriously disappear. Soon, she'll be old enough to make that distinction herself, I think. It will be interesting to see what things she holds most precious. Do you buy souvenirs when you travel? What things are most precious to you? Bonus points if you catch the reference in the title of this post! We do have plenty of tchotchkes from relatives' travels. My sister and my parents especially. DH seems to generate bric-a-brac as well, as do preschools and elementary schools. But we don't buy stuff from Crate and Barrel or from Pier One just for the sake of having it. Tchotchkes are something that come to a person unbidden even without visiting home furnishing stores. See, I'm not really a culinary tourist, or at least not in all places. Some cuisines just don't excite me- but I still love visiting those places. I used to buy stuff from Pier One, back before I'd traveled much and gathered souvenirs. I don't buy many decorative things at home now, but I suppose if I came across something I loved, I'd still get it. I have some friends now who decorate with things almost exclusively they've found locally, and their houses look beautiful- much less hodge podge than mine. So to each their own, I guess. Hey, if they want to look like they live in a catalog and spend time cleaning stuff, that's their business. I just don't want to hear them complain about their partners not doing their fair share of dusting or how much time they have to devote every weekend to cleaning or how expensive their housekeeper is or how little money they have to do things they truly value. Choices = consequences. I try to make sure that everything in my house is meaningful and useful, which means I try not to hold on to tchochkes as Nicole and Maggie define them above, and I also don't buy random decorative items from home stores. In the room where I'm sitting now, I have a carved box I got when I lived in Korea, a framed piece of embroidery from a trip to Hong Kong, a brass rubbing I made of an old tombstone in London, a watercolor my great grandmother painted of the house she lived in when I was a little girl, and a carpet I bought on a business trip to the Middle East. These things bring me a lot of happiness because they remind me of interesting and meaningful parts of my life. As for cleaning the souvenirs, I have pretty relaxed standards and so far my kids think dusting and being allowed to use a spray bottle of organic non-toxic cleaner is great fun. We'll see how long that lasts. My kids aren't old enough to trust with dusting yet- too likely to break things. But they do an awesome job swiffering the floor now and then! I am also a clutter phobe as we have enough clutter without buying random stuff from home stores. For souvenirs, I like to buy Christmas ornaments (SMALL!) so I've got some from India, St. Maarten, Germany and now Ireland. Usually I buy just one or two and try to buy something non-breakable. I just did a huge purge last year of Christmas ornaments that were not meaningful - ie those stupid glass balls I bought at Target because they were 50 cents for the whole box after Christmas, or whatever. For my first few years on my own, I needed "filler" ornaments, but now we have plenty of good ones. My other favorite "souvenir" is a leather Roots purse I bought on our road trip through Canada. Functional and a good memory. hehe. I do love Vancouver. And good socks are hard to find! I don't usually buy much when I travel, but I've been known to pick up an ornament, or something small. I do have a carving we got in Mexico on our honeymoon, that I love, but mostly we buy food. Pumpkin is a girl after my own heart. I've been collecting pins since my family's first "big" trip when I was 10. Sadly, I lost one of the first set when I used to wear them pinned to my hat. They're pinned to ribbons hanging on the wall now. They're small, cheap and pretty easy to find, and it makes me happy to follow the chronology of my travels along the ribbons. Going to local art fairs became a hobby when we had vast swaths of empty wall (and shelf) space, but we're starting to run out of room, so we'll have to start being even more selective. My pins are still more precious to me, though. I'm a hoarder by nature so I really have to reign in my collecting instincts when go abroad (I've already filled our house with antique ceramics). I've managed, in recent years, to restrict myself to prints and jewellery (except when we go to Japan- there is just too much nice crockery there for me to resist!). My favourites are my black and white woodcut from our honeymoon in the highlands, a very subtle temple woodcut from Japan, a stylised painting of Nottingham rooftops and lastly, my ENORMOUS Kylie Minogue poster from a retrospective exhibition at a major London museum (where I lived for a time). I love having things on my wall that all mean something to me personally rather than just bland art pieces from ikea. I too collect jewelry as a I travel. I think my favorite is a silver bracelet with a piece of beautiful green Conemara marble set in it, which I bought in Ireland. I do buy my children souveniers when we travel, but it's Christmas ornaments rather than pins. That way, my boys will have a Christmas tree that tells the story of their adventures. The ornaments are small, easily packed, and easily stored. Although now that you mention pins, I may have to see if my boys are interested. That is a fabulous idea! I only collect memories and photographs. I'm so not a souvenir person. Home stores do have their place, and (for those who care) there are ways to incorporate their mass-produced wares with more quirky, well-loved souvenirs. The cool kids call it "mixing high and low" and it is apparently quite fashionable right now. But perhaps the correct term ought to be "mixing low and low." So even with pictures, we manage to make stuff! "I only collect memories and photographs." That's my t-shirt, too. Tate is still in a collecting phase, rocks, any and all if I'd let him, and dinosaur toys. I think the only souvenirs I've brought back from a trip were rocks found along a river for Tate on my last trip to Wyoming. I'm also not a souvenir person. Photos yes, and occasional postcards and posters, and clothes when I can't resist something in Rome. But really, I try not to buy things. Well, I don't "try not to", I just don't, because that's not the way my brain is wired. I appreciate houses that have a nice collection of meaning objects from travel, but I don't think my own house contains one object from a trip that was not a gift. I'm not really a souvenir person; I was dragged by my hoarder parents to many, many shops and markets while travelling as a kid and now I tend to avoid those things like the plague. I prefer pictures to anything else. At home I'd say a lot of our decorative stuff has been gifted or inherited, but some is purchased. I like clear surfaces but my husband likes some things around and we work it out. Little fingers do help at keeping stuff down. We also have a tendency to "wallpaper" with bookcases. Although e-books are helping. I will say that I have friends who decorate full out including purchases from HomeSense or whatever, _and_ seasonal rotation and I love their homes. I think it is a real gift to make space beautiful and keep it that way. I think when you really love your space and objects sometimes it's not that onerous to dust them; you can enjoy handling them etc.